Mood board: Paula Gerbase may have sighted the mundane details of the ‘every day’ as inspiration for her LC:M menswear debut, but the result was anything but humdrum. Having cut her teeth on Savile Row, Gerbase has long been a fan of reductionist tailoring. 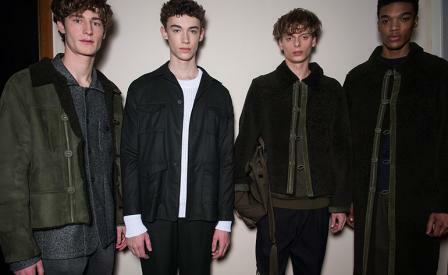 However, it was the purity and discipline of her A/W 2016 menswear offering – from exquisite waffle weave tailoring to shearling coats fastened with interlaced buttons – that gave us a seriously stellar LC:M start. Scene setting: Gerbase’s collections have always leaned towards an architectural oeuvre so her decision to show at the under-utilised (as far as fashion venues go away) Royal Institute of British Architecture was a spark of genius as bright as the oversized glowing globes that lit her runway. Best in show: Just as we’ve come to expect from her 1205 womenswear, Gerbase’s microscopic gaze was once again dutifully focused on the finer details. The Brazilian-born Saint Martin’s grad’s fascination with creating custom-designed cloths (this season featherlight Nylons and a jersey-like twist on chord) was only surpassed by her penchant for unseen trimmings, which she concealed within garments so as to be only apparent to the wearer. Here, her subtly quilted suiting was just as interesting as the casual ease of a classic fisherman’s jumper worn with tweed ‘tracksuit’ pants.